Just a quick reminder that there is about a month left to get 12 colors of Blendabilities trio marker packs for just FREE with a $50 purchase during Sale-A-Bration. Please use the item numbers on page 20 of the Sale-A-Bration brochure (regular item numbers are on page 212 of the Annual Catalog). Card measures 6" x 3". Decided to change things up a bit with size, and it fit what I wanted to do, a scallop border using the circle punch. The sheet of Moonlight DSP helps carry the circle theme to the card. 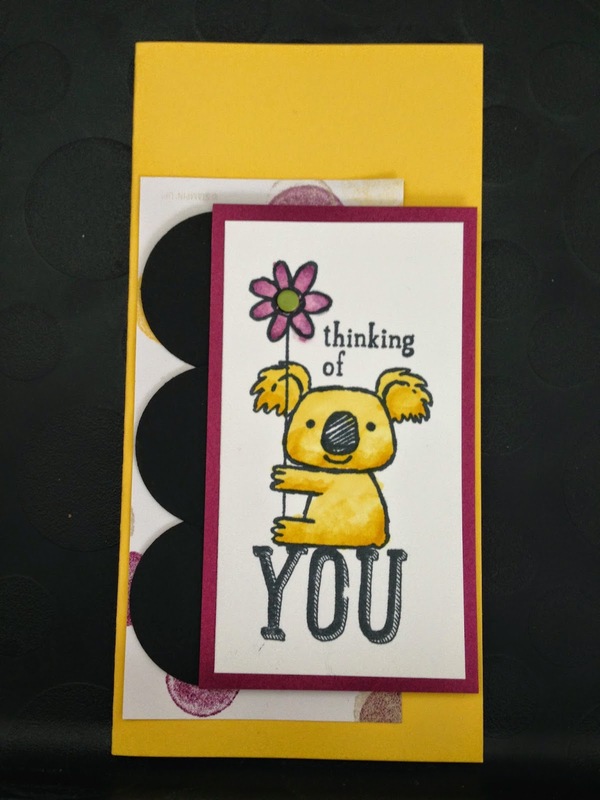 The Kind Koala stamp works well with Blendabilities, and other markers or coloring tools. It is a single wood mounted stamp, great value. You can just stamp the YOU word for any occasion too.